It wasn’t too long ago that Luis Severino heard the cries of skeptics prior to the A.L. Wild Card game -- myself included. Following Severino’s second-half of the 2018 regular season, his performance in the 2017 A.L. Wild Card game, the consistent pitching of J.A. Happ and the more recent stellar outings from Masahiro Tanaka, there seemed good reason to be skeptical. There were more consistent choices for Aaron Boone to run out to the hill, and while Severino’s fastball is unmatched by any of his teammates, in a win-or-go-home situation, consistency and reliability could very well win out over flash. Not to mention, fans were not about seeing Severino face his own personal demon for the second year in a row, with the possibility that he couldn’t defeat it and win. … only for Severino to prove to all of the skeptics that yes, he could rise to the challenge of the role of starting pitcher in the A.L. Wild Card game. In fact, he blew all concerns out of the water. It didn’t take but a few pitches for fans and coaches alike to see that this Severino was different than the Severino who was pulled from the Wild Card game after just 0.1 IP, allowing four hits and three runs. The Severino of Wednesday evening came out of the gate throwing 97 MPH fastballs, striking out his first batter in Nick Martini, and then continued to mow down the rest of the side in a one-two-three inning. He threw up zeroes through the entirety of his 4.0 IP before Boone went to Dellin Betances to finish out the fifth. He allowed only two hits, half the amount of hits that he allowed in last year’s game, and those both came in the fifth -- meaning that Severino was even unhittable through four. 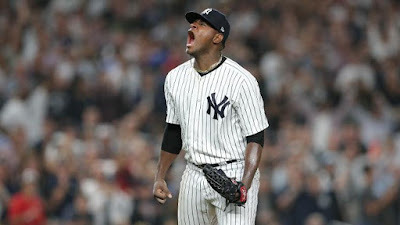 It was almost as though Severino knew that he had something to prove in that first inning alone, and he proved it -- to the fans, to his teammates, to his manager and to himself. Of course, there was more reason for skeptics to be unsure of Severino, 2017 Wild Card aside, especially considering the depth of his struggles in his most recent regular season start against the Athletics (2.0 IP, six hits, six runs). And there’s no real evidence to support the fact that the Severino that could be trusted in the first half is here to stay for the remainder of the postseason; this is baseball, after all, and anything can happen. Not to mention, while Severino won his last two regular season starts, he earned a few wins mixed in with losses over the month of August. However, even in those starts in which he picked up the W, those starts weren’t nearly as clean as Wednesday’s -- in his September 19th start against the Red Sox, he recorded an error and allowed six hits over 7.0 IP. In his last regular season start on September 25th in Tampa Bay, he allowed four hits, two runs, walked three and recorded two errors over 5.0 IP. By comparison, there were no Severino errors on Wednesday night, and he allowed twice the amount of hits in his last start as he did in the Wild Card game with just one more inning pitched. So, while nothing can be said for sure, the argument can be made that Severino looked more like his old self on Wednesday evening than he has recently, as evidenced by stats that aren’t limited to wins and losses. While the Wild Card game was a win-or-go-home game, and Boone’s main concern needed to be winning before thinking ahead to a potential ALDS in Boston, the fact that Happ (who has already been given Friday’s ball) and Tanaka are now available for the beginning of the storied Division Series is a bonus by-product of the Severino Wild Card game start. And, while he can’t go on the record with such a statement, it’s easy to speculate that possibility factored into Boone’s thinking when he tapped Severino to start on Wednesday night. Did Boone have choices that would have worked as well as Severino in the Wild Card game? Very possibly. Did his decision pay off for the long-term as well as the obvious short-term? Absolutely. In Happ’s last two starts against the Red Sox, he allowed a combined total of 13 Ks over 12.0 IP. The Sox have reason to be nervous for Friday. Did Severino and Sánchez settle their score? 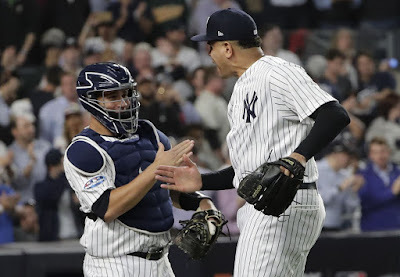 “This time I was going to make sure none got by, Severino was amazing, we were on the same page, he was dealing all night long,” Sánchez told the New York Daily News during a clubhouse interview following Wednesday’s victory. The article continues to cite issues in signal changes as the problem with the September 4th Severino/Sánchez appearance against the Athletics. As if the win (in which Sánchez saved Severino from the Athletics scoring a run in the top of the fourth), as well as Sánchez’s clubhouse quote above, were not evidence enough that the pitcher/catcher duo had indeed corrected their communication errors, Boone weighed in on the situation at his Tuesday press conference prior to the Wild Card game. “Those two are very close, so sometimes some of the things they get into that have been seen, I guess, as just two passionate guys, two guys that are like brothers in a lot of ways,” he said. In conclusion: did skeptics have reason to be skeptical? Yes. But Severino took all of those reasons and, essentially, clapped back at each one individually. And, going forward into postseason games, I know I’ll have a bit more faith in the Yankees’ ace than I did before.